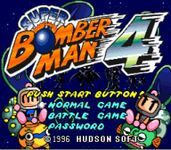 Super Bomberman 4 is an action game in which players lay bombs to destroy enemies or other bombermen. The story begins at an unknown time after Super Bomberman 3. Bagular's brain escaped the explosion of his flying saucer and has summoned the Four Bomber Kings and Great Bomber to get revenge on White and Black Bomber. The two, along with other fellow bombermen, are sent hurtling back in time to fight through different eras and ultimately stop Bagular. Certain stages contain cages with trapped allies inside. When freed, allies move around the stages mostly destroying the soft blocks. Stages also have secret warps which transport the player to a number of bonus stages. This warps can only be accessed when two players play the game together, and one player, using the Power Glove item, tosses the other player to the warp. Source: Wikipedia, Super Bomberman 4 , available under the CC-BY-SA License.